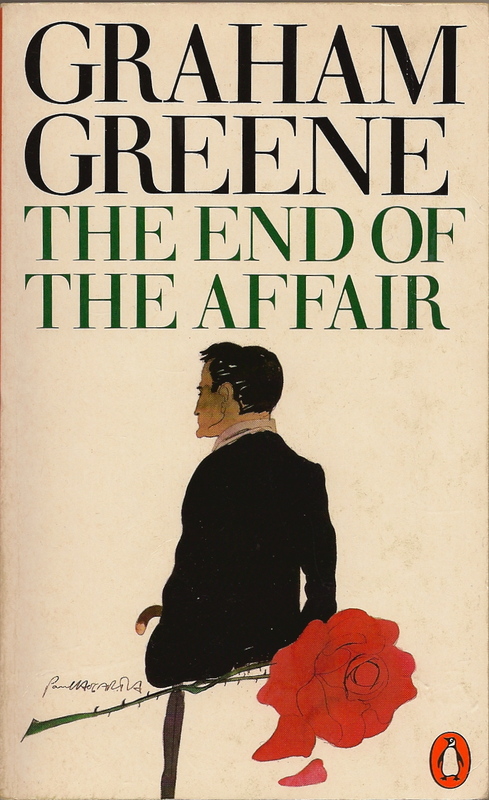 In the late 90s, I went on something of a Graham Greene reading spree — because his books are good, but also in sympathy with our son, who had to read ten books by one author for a high school class and had chosen Greene. Recently, I’ve had the yen to re-read some of those books, and when two writers mentioned The End of the Affair in a Valentine’s poll of “Romantic readings”, I decided now was the time, for one at least, and that’s the one I returned to. I had forgotten most of it, I confess, since my first reading in 1998, except for a lingering sense of the dark, rainy, brooding Common in London upon which the story opens in 1946. But, gradually it came back, and all the wonder and surprise of it too, for if it’s “one of the best novels ever written about love,” in Pasha Malla’s words, it’s probably also one of the most unconventional. Maurice Bendrix has had an affair with the married Sarah Miles, which she ends abruptly and without explanation. Turns out that the rival, whom the embittered Bendrix wishes to find out and ruin if he can, is [Spoiler Alert] none other than God. Narrator Bendrix insists from the beginning that this is a story of hatred, though he doesn’t do much better at hatred than love. (He’s got a lame leg, which reminds of Jacob, another compromised fighter-of-God.) This is a book that explores the great passions of life, which include love, hatred, and jealousy, but also fear and faith. It’s such a pleasure, though the word feels too sweet for what I mean, to wrestle with faith along with writers like Greene and Flannery O’Connor, who let it in, full tilt, always at the service of their marvellous style, but never simplistically or unambiguously. There’s a strange mystical turn to things in The End of the Affair, but I better not give anything else away, except for one fragment that caught at me, from a letter Sarah Miles writes the lover she’s left (though never stopped loving). But what’s the good, Maurice? [Sarah wrote] I believe there’s a God — I believe the whole bag of tricks, there’s nothing I don’t believe, they could subdivide the Trinity into a dozen parts and I’d believe. They could dig up records that proved Christ had been invented by Pilate to get himself promoted and I’d believe just the same. I’ve caught belief like a disease. I’ve fallen into belief like I fell into love…[because of something unexpected that happened]… I fought belief for longer than I fought love, but I haven’t any fight left. This might not pass as a testimony of faith in many of our churches (too irrational), but she’s getting at a truth we might pause to remember, and that’s the strength of God’s pursuit of us: relentless, faithful, and not always welcome either. We need to remember this when we begin to think it’s all about us reaching Godward to touch and worship, as I suppose many of us will Sunday (tomorrow) morning. In fact, we’re just as often wrestlers or runners-away, keeping company with Jacob, Hagar, and Paul (and Sarah Miles and Maurice Bendrix), and we just may be — finally wearied — undone or outrun. This entry was posted in Books, spirituality and tagged Graham Greene, Hagar, Jacob, Paul, The End of the Affair by doradueck. Bookmark the permalink. Nice reflection. Graham Greene is a longtime favourite of mine. On first reading, this particular book impressed me most by the sheer craftsmanship of the plotting. And the mood. Probably time for a re-read. Yep. I’m struggling, inwardly, right this moment. I’ve been struggling so hard, for nearly four years. It’s ‘morphed’ in that time, little by little, but i’m old enough to recognize it’s another of my struggles, for my will. We try so, to not be human, each in our own way. I believe what i’m learning now is, we’re meant to be human, that the effort “to seek Grace” is the “operative” message, that holding our hearts and minds and souls in protective vaults is not what we’re intended to do; that it’s intended for us to be challenged and vulnerable (as opposed to stupid and reckless) – even when we were sure we “should be” old enough to know better. I haven’t read this book, but i feel the correlation, on an opposite path. I believe i will always be both confounded and grateful for my faith, i pray for Him to Light my path, to lessen my stumblings, knowing the stumblings do not go away in mortality. Whether we like it or don’t. And, we don’t. We (think) we like neat little packages, tidy and complete. But that’s not His way. His way is not like our way. We are to struggle AND have faith. His ways are so much better than our ways. We really can make a mess of anything, no trouble at all. I found this striking because I grew up thinking of baptism as the result of a personal decision, a common view among Mennonites I think. And yet here is a Mennonite teacher (C.H. Wedel) emphasizing that you are led to make this choice, and talking about God persisting till we learn to seek and to long for him. What a lovely bit of serendipity for me this morning, Joanne, the C.D. Wedel quote and your remarks, and taking me back to the post as well, which, since I’ve just finished Rudy Wiebe’s “Come Back” reminds me of another fine writer who lets faith in “full tilt”, and in the spirit of struggle “temporal1” mentions in the comment above (I see I didn’t reply–maybe I didn’t in my blog-writing then?) reminds me also of a book we’re discussing in my book club this evening, the first half of “The Case for God” by Karen Armstrong, which seems (I say tentatively, not even to the half) to posit things in the opposite direction, that it’s in the disciplined effort to the Unknowing that we come to Know.) Thanks for writing and stirring my mind.